Transparency Market Research (TMR) has published a new report titled, “Drugs of Abuse Testing Market - Global Industry Analysis, Size, Share, Growth, Trends, and Forecast, 2018–2026”. According to the report, the global drugs of abuse testing market was valued at US$ 4,452.5 Mn in 2017 and is projected to expand at a CAGR of 5.5% from 2018 to 2026. Increase in impact of drug and alcohol abuse on public health, rise in demand for drug abuse testing among private employers, and surge in abuse of prescription drugs are anticipated to augment the global market from 2018 to 2026. Abuse of prescription drugs or nonmedical use of prescription drugs has become a serious public health issue owing to its high prevalence and mortality rates in the U.S. Illicit use of prescription drugs has increased in the past few years which has resulted in rise in number of deaths caused due to drug overdose. According to the National Survey on Drug Use and Health in 2015, lifetime rates for illicit drugs use varied among different age groups. The rate was more than 50% for persons aged 19 to 59 years, 53.8% for persons aged 60 to 64 years, and only 25.8% for older population aged 65 and above. This increase in use of illicit drugs is anticipated to drive demand for drugs of abuse testing during the forecast period. Drug abuse is a serious health issue posing significant impact on the health, business, and society as a whole. Individuals using illicit drugs at workplace affect the productivity and competitiveness of the business sector. Several private employers are now conducting drug abuse testing regularly for their employees to curb economic burden of costs, lost work productivity, and health care caused due to drug abuse. Increase in demand for drug abuse testing services among private employers is expected to drive the market during the forecast period. According to the National Institute of Drug Abuse, alcohol, tobacco, and illicit drugs create an economic burden of nearly US$ 740 Bn in the U.S. through related costs, lost work productivity, and health care. 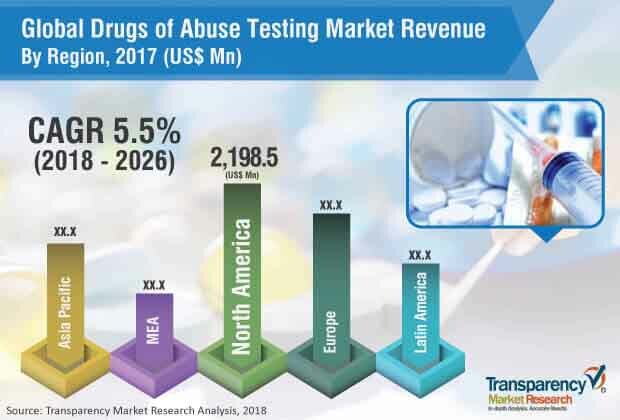 The drugs of abuse testing market is anticipated to witness sluggish growth during the forecast period in developing and underdeveloped countries in Asia Pacific, Latin America, and Africa. This is attributed to low awareness about drugs of abuse testing services coupled with inadequate social support and lack of stringent regulation which make drug abuse testing mandatory. According to a report published by the World Health Organization, nearly 77% of children in Brazil are reported to consume alcohol regularly. North America accounted for the largest share of the global drugs of abuse testing market in 2017. Rise in drug consumption, increase in awareness about harmful effects of drugs, and surge in workplace screening are factors boosting market growth in the region. The consumables segment in North America accounted for the largest market share in 2017. Usage of reagents and consumables such as gloves and sample collection devices is increasing in the region. This in turn is expected to propel demand for drugs of abuse testing consumables in North America. An estimated US$ 600 Bn is spent on addressing the impact of substance abuse in the U.S. each year. According to the Substance Abuse and Mental Health Services Administration (SAMHSA), nearly 22.5 million individuals aged 12 and above were reported to seek treatment for alcohol and illicit drug use in the U.S. in 2014. The global drugs of abuse testing market has several players offering various products for screening of illicit drugs and alcohol consumption. Alere, Inc. is anticipated to dominate the global market during the forecast period, followed by F. Hoffman-La Roche Ltd. Technological advancements, rise in awareness about the availability of drug abuse testing solutions, and adoption of expansion strategy by major manufacturers to increase global reach are anticipated to propel the global market during the forecast period. For instance, Siemens Healthineers provides education through Syva Drug Testing Online Campus for customers to keep them abreast of important information and emerging trends in drug testing.